This post is about two related things: modelling actual detailed architectures of large homogenous landscapes and the class versus instance issue in ArchiMate. Both are closely related. But before I start out, for those unacquainted with Object-Orientation, or Classes and Instances (the notions are strongly related but not perfectly identical) I will give a very short primer on the underlying concepts. And if you are new to ArchiMate, please skip this post, it contains non-standard ideas for ArchiMate and it will probably only confuse you; the language is really not that confusing if you learn it first (e.g. by reading the book). A Class is the name generally used in IT for `a type of thing’ as opposed to `a thing’, which in IT is called the Instance. In natural language, it is not always clear from words or syntax if a Class or an Instance is meant, though sometimes there are strong signs. The use of the pronoun ‘the’ is more often connected to `a thing’ while the pronoun `a’ is more often connected to a `type of thing’. Compare for instance “Give me the ball” versus “Give me a ball”. The first is almost always a specific ball (an Instance), the latter almost always any ball (a Class), but it may be also one Instance of a Set of Instances. Natural language is a bit fuzzy about these (and other) concepts, we should not be surprised. But in IT and related disciplines, there is a clearer distinction. The Class Ball stands not for an existing Set of Balls, it stands for the — almost Platonic — idea of a Ball. Now, in IT we’re not as vague as Plato’s famous shadows on the wall (where the shadows stand for the instances of some ideal concept that throws them), we are pretty specific. A Ball, as a Class has properties and methods. Properties are aspects of the ball, such as size, material, colour, and methods are how the ball `behaves’, e.g. you may inflate or throw a ball, inflate and deflate being `methods’ of the ball (not the person in- or deflating it). These methods together form the balls Interface. A typical software engineering example is to have methods for checking if the ball is inflated (isInflated – returning TRUE or FALSE) and inflating or deflating the ball (inflate – using this method inflates the ball, deflate – using this method deflates the ball); the latter methods may change the size property of the ball. Assuming only inflatable balls exist — and not, say, a cannon ball — we can illustrate the difference between Class and Instance. You can in- or deflate an actual ball — the Instance — but you cannot in- or deflate the concept, the idea, of a ball. Instances are real things, Classes are abstract things. You cannot play real football with the concept of a ball, you need a real ball, an Instance. Now, to make matters a bit more complicated, we can make SubClasses. We can make hierarchies of classes, as in “a Ball is a Toy”. What we say here is that we have a Ball concept that inherits its properties and methods from the Toy concept. So, if a Toy has a method “playWith”, a Ball, being a type of Toy inherits the method “playWith”. You can play with a Toy and since a Ball is a Toy, you can play with a Ball. The other way around is not true, just because you can inflate a Ball, it does not follow that you can inflate any Toy. I’ve been known to promote modelling your current state architecture in a large ArchiMate model, it can be a rather powerful tool in the fight to handle Business-IT complexity. 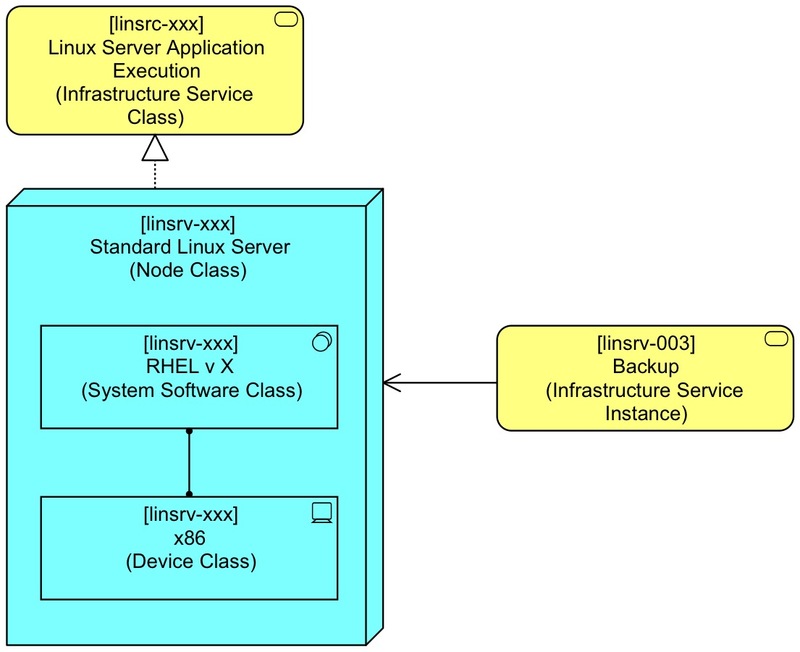 The question you then have to answer: do I make an instance model, a class model or a mix? Let me explain. If you build a full instance model, you have to model each and every server, each with his own contents like operating system and so forth. Do you have 200 Linux servers? You have to model all 200 independently. Now, 200 servers is not a big deal (really, in practice it isn’t), but if you have 1500 desktops do you want all of them individually in that current state architecture model? Do you want your current state model be a full CMDB, keyboards, screens and all? Nothing in ArchiMate stops you from doing that, but we all feel that that is really a bad idea. So in my practice, so far, we have modelled all servers individually so we can actually say in the end which process depends on what server et cetera, but for the client systems we have modeled a few configurations. We get away with that because we know these desktops of the same configuration are really completely identical and the conclusions we draw from the model remain trustworthy. These configurations in fact act as Classes in our landscape. The real server landscape, however, may have a lot of variation. Another large organisation I know of, started out with configurations for servers as well. They found out after a while that there was so much variation, that the number of configurations was almost equal to the number of servers. Besides, at that level, it becomes important to know what instances there are, because even if your servers are identical, they are used by different applications. And without splitting the servers up in real instances, you effectively end up with a model of one big server that runs everything, and that is not the landscape you have, right? After all, there is no problem if two applications cannot run simultaneously on a single server, if you have two identical servers, one for each application. If your model reflects that, it becomes a more trustworthy tool for those kind of analyses. Of course, you can model with classes only. It is a matter of choice. It is a matter of what you need the model for. Both have merit and ArchiMate doesn’t care, it can handle both. ArchiMate is rather quiet about the issue. You see models that partly employ a `class’ way of looking at things (more abstraction), but then in the same models you then see specific instances of applications. ArchiMate is not very strict about it (one of the reasons why marrying it to UML will be a challenge, I guess). Anyway, ArchiMate has no specific way to show if an element is an Instance or a Class. You can do both and even mix both. I always advise people to be very careful with choosing between a Class or Instance approach to parts of the model. Mixing them is a prime source of sloppy models that allow for wrong conclusions to be drawn. But there are exceptions, as always. Suppose you run a very tight ship in your infrastructure. You have thousands of (virtualised) servers, but only a limited number of configurations and your infrastructure change and management processes see to it that this remains so. The question then is: Isn’t there a smarter way to model so you get the benefits of an Instance model (actual conclusions about the real landscape – useful for change initiatives, reporting, et cetera) with the advantages of a more Class-like model, where the same configuration is not modelled a thousand times? For ease of reading the models, I have added the words Class or Instance to the (Type) part of the labels. I immediately added a bit of complexity to the example: You see that the Node and it contents are Class elements and also the Infrastructure Service it Realises. But the Backup Infrastructure Service is an Instance. 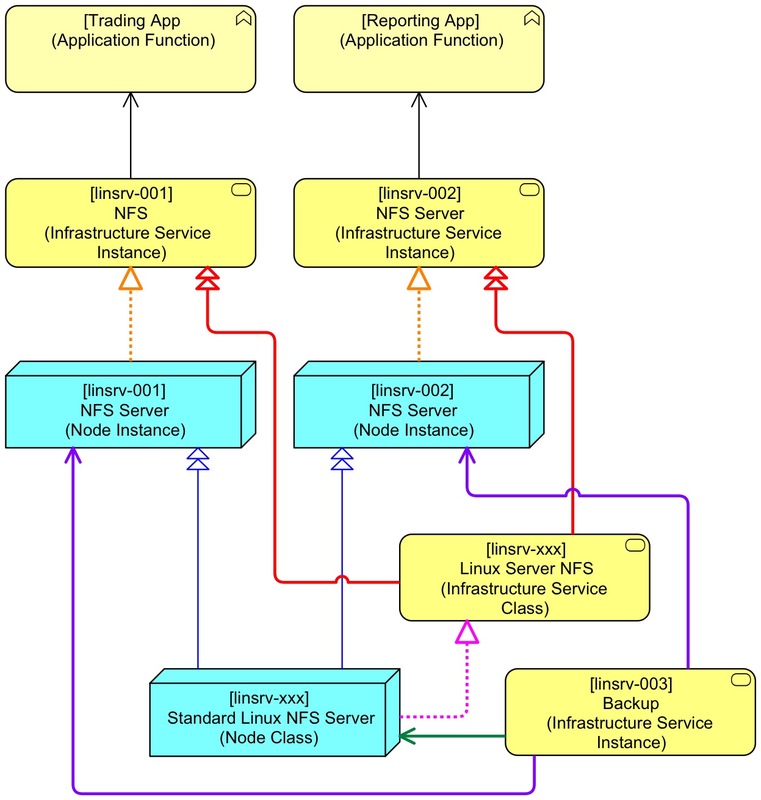 There is a single real server in the landscape that runs the Backups and this little model says that every standard Linux Server uses that specific server. I have modelled the Node as full encapsulation. 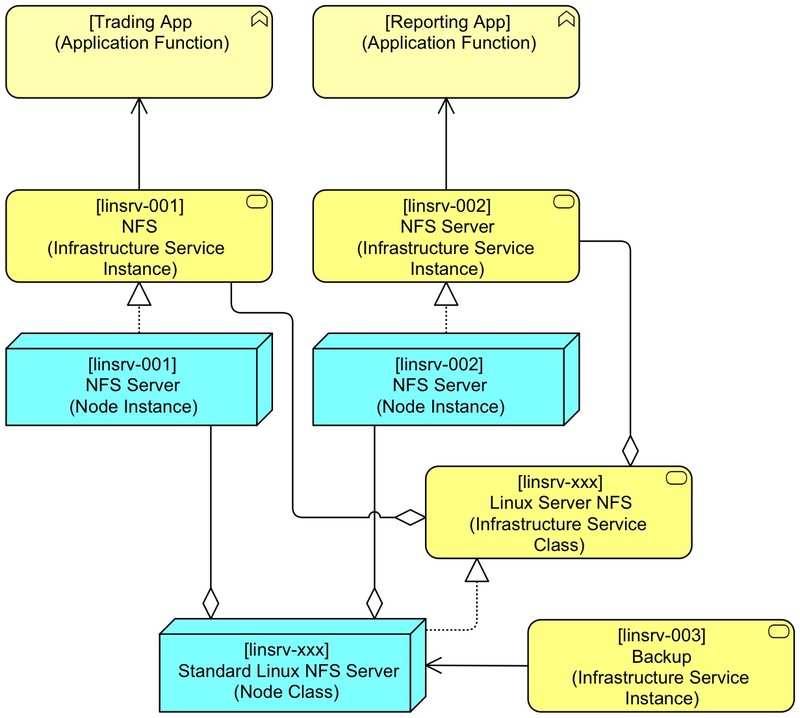 While it is the RHEL System Software that uses the Backup Infrastructure Service, I have connected that Infrastructure Service to the outside Node. This makes using the Node as a basic building block later a lot easier as we will see. Here we encounter a first `problem’: According to ArchiMate, you cannot use the blue Specialisation and Realisation relations to derive the red Realisation relation. Which is quite strange as it obviously makes perfect sense, but for now just one of the quirks of ArchiMate’s somewhat messy relation derivation algorithms. We might fix that if Specialisation would become part of the derivation algorithms, but let’s not decide too fast that that is a good idea. Again, we know that the orange Used-By makes perfect sense based on the blue Specialisation and the green Used-By. If we would allow this derivation we would run into ArchiMate’s idea of a direction of relations. You are only allowed to make derivations if the route exists of relations all in the same direction, but what direction does Specialisation have? For the Realisation it needs to be from child Class to parent Class, but for the second the other way around. And making it bidirectional creates havoc: the standard Linux server starts to provide the NFS service. Clearly, the derivation mechanism of ArchiMate cannot cope with reality here. We could say it less strongly and say that you may move the endpoint of any relation from the parent in a Specialisation relation to its child, thus making it a true derivation. The exact wording can probably best be left to a committee. 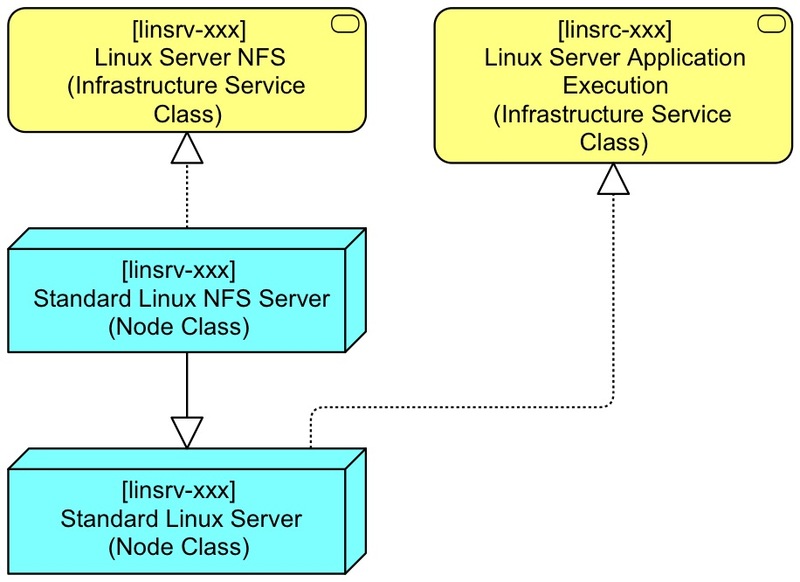 Here, I have instantiated two real NFS Servers Instances from the NFS Server Class. I have not used Specialisation because that is not what I am doing. I am not specialising the NFS Server Class, I am instantiating it. ArchiMate has no relation for that, and you sometimes see people using the Specialisation relation for this. I think that is a bad idea, those Instances are not Classes. It is closer to reality to say that the Class is a kind of Set, the Set of all Instances. And aggregating elements in a set is the job for the Aggregation relation. This solution also allows valid derivations, e.g. we can derive that the real Backup service is used by each real NFS Server. 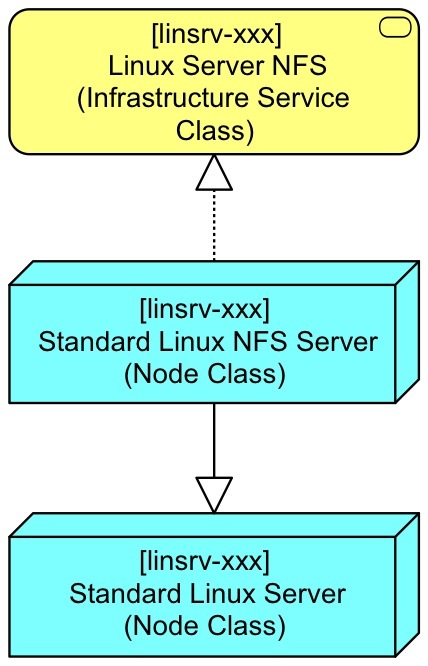 Now we, as intelligent humans, know that the Class version of the NFS Infrastructure Service gets instantiated with the Node in its own Instances. In fact, this must hold true for each element that makes up the Class version of the Server, including for instance the Infrastructure Services being Realised. There can be no real support for this in ArchiMate itself, I suspect, but tooling could provide support for this. As you can see, I have invented an Instantiation relation for ArchiMate, the arrow that ends in a double arrow head. The blue relations (two Instantiations and one Realisation) and the red Instantiations could automatically provide the orange Realisations. From the Instantiations we can infer that the Realisation relation in the Class pattern must be replicated for each Instance. I’m ending this `thinking out loud‘ exercise by adding the Backup Infrastructure Service Instance to the picture. 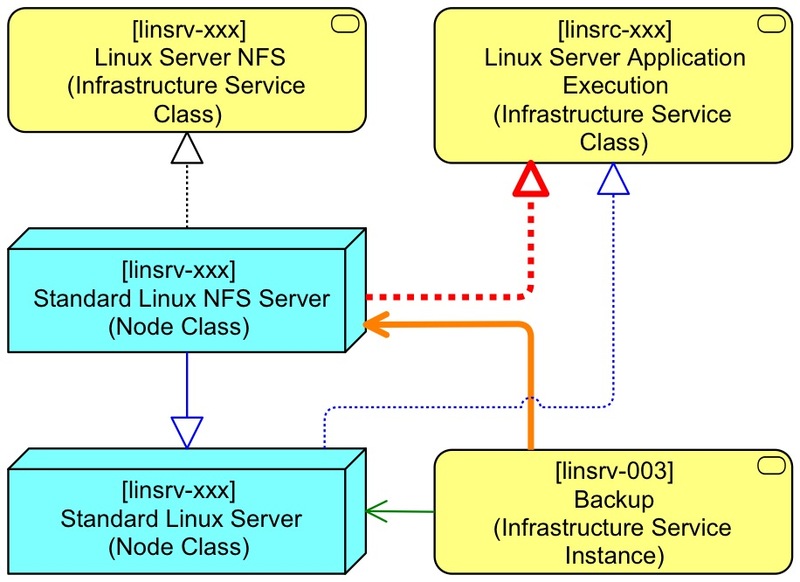 Since the Class version of the NFS Server uses this service, we can infer that each actual NFS Server that has been instantiated from the Class also uses the backup service. What is the advantage of all this work? Well, suppose you have to model 500 identical copies of a standard Windows Server, and you know that changes to the setup will happen to all instances more or less simultaneously. 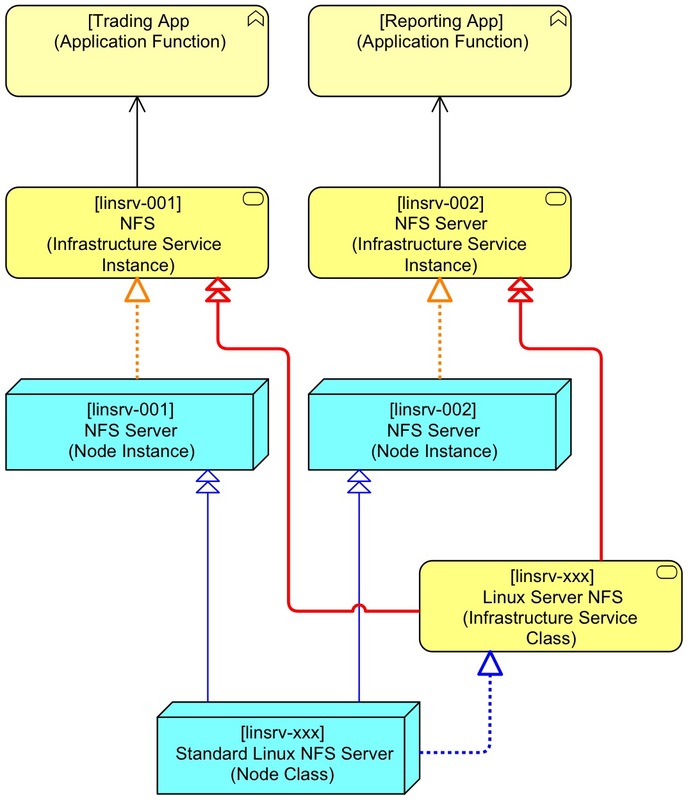 Then, you only have to model one Windows Server in Full (maybe 4-5 elements in a Node) and for the rest use only an empty Node representing that same complexity. And if ArchiMate or tooling would allow the passing on of relations from Class to Instance patterns via an Instantiation relation, analysis would probably become rather easy, irrespective of the levels of SubClasses you have created. But that is fantasy for the moment. A warning is required here: this is not a final proposal to model homogenous Instance landscapes, nor a final proposal to change ArchiMate. This is thought in progress. But fun to do. Some comments: such derivation mecanism would be very similar to the one for dynamic relationships, thus making it a good candidate for next spec version 😉 Taking the assumption that a derivation rule exists for specialization, then we could simply see “Instantiation relationship” as a specialization of the “Specialization relationship” (which is valid in Archimate) and then your orange “Realtization relationships” become perfectly valid. So to summarize, only one small change is needed in ArchiMate to make all this happen. The current ArchiMate standard allows the use of Specialisation to create new concepts (subclasses of existing concepts). It does not allow subclasses of relations. What illustrates the bit of fuzziness in ArchiMate in this area is that in the examples, there is an example of reverse Specialisation. Yes it does… I was thinking about “9.2 Specialization of Concepts and Relationships” which relates to stereotypes and profiles. Of course, such solution requires to have a tool supporting it, which all tool makers claim (part of ArchiMate Tool Certification) but no-one does in real life. You’re quicker than I am. I was wrong, Specialisation of relations is allowed, but indeed with the exception of Specialisation itself. ArchiMate has a non-strict definition of Specialisation. It says that the child need not conform to all the properties of the parent. No Liskov Substitution Principle here. Not a big deal, strict logic isn’t going to bring us the answer anyway. Yes, but in this case we still have to add a specific rule for derivation that would not have been needed with a specialization of specialization and an extension to derivation for dynamic flows (not sure it’s clear but I guess you understood). Maybe a 3rd alternative: use the specialization relation, but add an attribute to the active structure concepts to indicate that the active structure concept is an instance of the parent. That way you don’t need any changes on the relations. If an active structure element is an instance, you should not add any relations with behavioral elements that cannot be derived from the relations of the parent object. Having the attribute that way is logically indistinguishable from having a separate relation, I think. Your last statement seems to restrictive to me.